Read more on how taking part in the Festival has transformed the lives of young people and their teachers, across the UK. This is a story from a proud head teacher, Andy George of Laughton School in Milton Keynes. He told us this after his former student Milly, and her mum, came back to visit him after she had moved onto secondary school this summer. "Milly was a very quiet, not very confident girl and her mum remembers that she would not even stand up for the Christmas Nativity when she was little because she was too shy. Fast-forward to Milly’s last year at Loughton School, she successfully auditioned for our first year with SSF, taking the part of Polonius in Hamlet. Milly was one of the key players in the performance. She quickly grew in confidence and her acting ability, drive, focus and her obvious love of what we were doing shone through, both on and off the stage. Her performance, along with the other cast members was outstanding, and all of us were blown away by the power that Milly and the other actors showed. Milly blossomed for the rest of the year, and made amazing progress in her learning. Milly told me she attends a Saturday stage school, and has been selected to appear in a West End junior production next spring. She intends to study drama and acting as she goes through her education, and ultimately wants to join the theatre. She is currently studying The Tempest, and enjoying it marvellously. Shakespeare Schools Festival has been instrumental in helping Milly find her passion and direction and for bringing her confidence to amazing levels. Both her parents and the school cannot recommend SSF highly enough." As well as being entertaining and a fun way for students to make their first steps onto the stage, SSF also provides emotional support and confidence for children in a way that makes a significant difference to their lives in the long term. In Hull, one student in particular found participation in the Shakespeare Schools Festival changed the way he approached going to school. Will was being bullied in Year Eight, and didn’t have a lot of confidence. In Year Ten, he took part in the Festival after watching a performance the previous year. This experience enabled him to make new friends, with whom he now enjoys an active social life. Collaborating on a project with his peers has taught Will to value his own ideas. He feels as if he is able to give creative input into the production throughout the rehearsal process, and he wants to pay this newfound positivity forward. As part of achieving his Silver Arts Award he has started his own drama club, taking place once a week at dinner time. "I’ve targeted Year Sevens to Nines... just to get them interested so that when we leave someone else can do it. It’s about integrating other kids. It’s had an amazing impact on all of us and we want to leave that behind." "I thought this play was going to be so rubbish." Before getting involved in Shakespeare Schools Festival students are often sceptical of performing Shakespeare. But SSF aims to break down these pre-conceptions by breathing new life into these great works. Year 9 pupil Carolyn was one such student. After seeing her school’s previous production of Much Ado About Nothing she admits she didn’t really engage with the language and story. "I was watching it but it didn’t really catch my attention. I didn’t understand it." Despite her reservations, Carolyn made the bold decision to audition for SSF’s production of Othello in 2009. Her experience shaped the way she engaged with Shakespeare and drama. "I wanted to interpret and get to know Shakespeare for myself… When you are actually on the stage performing it you get a chance to understand it. I would highly recommend performing it." By giving young people like Carolyn the opportunity to interact with the plays in a practical context, students have the chance to discover for themselves the relevance, power and velocity of Shakespeare’s work. What would she advise other students who may be sceptical? "I would say don’t judge something on the way it sounds or looks, just go along with it and you’ll start to enjoy it. I would 150% do it again!" Taking part in the Shakespeare Schools Festival gives young people the opportunity to improve their concentration skills; particularly helpful when disruptive behaviour is keeping them from using their full potential. This is why Katie Brownsey, teacher at The Oxford Academy which is located on a deprived estate in South Oxford, took a leap of faith to support her students through the SSF process. One of her students, Jacub, was cast as Tybalt. The 14-year old student was struggling in school due to disruptive behaviour and ADHD. A difficult childhood, overcast by his father’s suicide when he was young, impacts his ability to perform well in school. Yet, his favourite subject is drama. Jacub recalls his anticipation about participating in the Shakespeare Schools Festival. The class performed at The Theatre at Headington, together with Mabel Prichard, a special school, in front of a large audience. Even the BBC watched the performance, filming Jacub play Tybalt for the show Old School with the Hairy Bikers. “My heart was beating really fast until I had said all my lines and my bit was over. Then I felt like I wanted to do it all again”, Jacub told us. Participating in the Shakespeare Schools Festival was a truly transformative experience for the teenager. Not only Jacub benefitted from the experience, Katie watched as her entire class’ performance improved. The Shakespeare Schools Festival is proud to work with special schools around the UK. By empowering children to perform Shakespeare using adapted scripts and rehearsal guidelines, parents and teachers have seen the incredible impact the festival has had on the lives of many children. For students at the Samuel Cody School, Shakespeare is a vehicle for exploring emotion; it literally gives many of them a voice for the first time. Where their autism restricts their ability to make conversation, being able to access the language, to own it and to vocalise it is their biggest accomplishment. Before the Festival, one of Samuel Cody’s students, Sam, couldn't look his teachers in the eye. But since performing in the Festival his confidence has grown considerably and he now initiates conversation in class. Another student, Paris, was very self-contained before partaking in the Shakespeare Schools Festival. He struggled to read and speaking up in class was a big challenge. But when he was given the lead role in Macbeth, he began to come out of his shell. By showtime he had memorised the entire script. The Festival provided the students at Samuel Cody the chance to rehearse and perform alongside mainstream schools, creating what one student called ‘an even stage’. The final performance was a uniquely powerful occasion where parents were able to ‘see for the first time what their child is capable of’. And for the teachers, ‘taking part in the Shakespeare Schools Festival was like the awakening of an imagination in them’. SSF's Festival process can really support the development and improve the mental health of participants. This is the story of 14 year old Jack who been learning in a behaviour unit for the last 3 years and joined our stage as Hamlet in his school's production. "At school, I found it difficult to work with other people...I was scared and worried because I wanted to get on with other people, but I couldn't. I felt like I couldn't learn and that meant I got angry. I found out about the Shakespeare Schools Festival and I felt like I wanted to be part of it and be involved. During rehearsals, I was able to work with other students...I felt like we were focused on something together and we were working together. I have made a lot of friends around school now and I am a lot calmer and happier.....When I was on stage I felt like the atmosphere was calm and peaceful in my brain. I didn't think about anything else except being Hamlet. When everyone clapped I couldn't help but smile and laugh. My friends were applauding me too and I was applauding them. I was speaking to a student from one of the others schools after the show and I got along with them. They said I was amazing and I thought they were amazing too. ...I have learnt that there is nothing to be ashamed of. I am proud of what I achieved." For schools with a high proportion of students for whom English is not a first language, involvement in the Shakespeare Schools Festival is a great chance to show pupils the beauty and range of these texts in action, and in doing so provide a practical platform to improve English skills. St Albans School found the festival particularly helpful. While the expected English levels for pupils graduating from primary to secondary school should be at Level Four, at St Albans 60% of the students were at Level Two. English Teacher Andrew Cooley wanted to show his students that ‘English wasn't just about taking an exam’ and suggested some of his Year 9 English class perform Othello for SSF. After a stuttering start - including a dress rehearsal where an entire scene was skipped by mistake because the young cast was so nervous - it all started to click. For one student, the faltering dress-rehearsal spurred him on to raise his game. Andrew was stunned at the 'wholly positive' effect the festival had on, not only the cast, but the other pupils in his English class. Yusef, who won a Drama Award for his performance, was given the responsibility of choosing the next SSF play they would perform. "Yusef has chosen Measure for Measure. He read the whole script, not the abridged version. It’s very challenging - I’ve only ever taught it to A-level or degree classes, [and] I never thought I’d teach it to Year 10." While St Albans did not have a drama department, SSF gave the school the opportunity to engage its students in a more theatrical context which led to raising the standard of English skills in the school. Performing isn’t the only opportunity for students to shine at the Shakespeare Schools Festival. There are many key roles in putting together a production, which is why SSF encourages young people to get involved behind-the-scenes. These technical roles can include marketing, costume, directing and even lighting & sound, which not only give practical experience, but are invaluable when filling out university applications and exploring future career prospects. Students Bryony and Morven were in charge of marketing their school’s performance of Macbeth. After watching the first rehearsal they were convinced the show would be a success and were determined to share the experience with others. "We wanted to show everyone what the cast had achieved and that they really could pull off such a mature performance of a complex piece of drama. This is when we decided we had to promote the festival as much as possible!" "We had, perhaps, a bigger challenge than other schools in that local people in our area live so far from Eden Court. When we first arrived there, we saw there were no posters up advertising the festival so we immediately asked if we could put some up." Their ambition and enthusiasm even led them to approach the local press for coverage of the event. "We asked newspapers such as The Oban Times, The Lochaber News and our local paper Westword to write articles on our production and encouraged them to talk to cast members." By giving Bryony and Morven the responsibility of marketing, the girls were able to gain valuable hands-on experience. "We have used it on our UCAS applications, it was the perfect way to show we had experienced marketing on a practical level, not just in theory." By embracing the many facets of theatre production, SSF provides a wide range of opportunities for young people, whether they are on stage or behind the scenes, proving that you don’t need to be under the spotlight to shine. Taking part in the Shakespeare Schools Festival isn't just a fascinating journey for the students but a chance for teachers involved in the process to gain new experience that will help them throughout the rest of their career. Tim Clarke, Head of Drama at St John’s College, discovered that the skills he learnt in a Teacher Workshop were useful above and beyond his festival production of The Tempest. He felt so invigorated that he started implementing them in his daily work at school. A favourite of his was the Archetypes exercise, which helps performers to capture key elements of their characters by fitting them into archetypes. He split his Prospero into two parts, one an avenger and one a caring character. "Watching it was like watching a spell." Tim had directed The Tempest three times previously, but this time with the support of SSF, he was able explore the characters in greater depth and create a piece that was truly innovative. The Archetypes exercise has helped Tim in every play since, and has gone on to have wider use in the school. When his department was being reviewed, Tim did a lesson using the exercise. It was such a great success that he is going to teach the exercise to other members of staff. For many taking part in the Festival the opportunity to work with a wide variety of students from different backgrounds is what makes the experience unique. Wycombe Abbey is an independent all girls schools in Buckinghamshire. The school’s headteacher, Mrs Cynthia Hall, told us that a large contributor to them taking part in the Festival is the opportunity to work alongside other local schools and that, in turn, this has a positive impact on Wycombe Abbey. For the students, the opportunity to work alongside those from different backgrounds is a great learning opportunity. Ella performed in the school’s production as Henry V and then again at a SSF Downing Street reception. She found both experiences very rewarding. "It was absolutely amazing to witness all these young people performing Shakespeare so well." Ella performed alongside students from primary schools, an Academy and also students from a special school, who performed A Midsummer Night’s Dream. "Not only did I deliver my speech but I also helped with Puck’s final speech, doing sign language at the end of the montage. The whole performance was just unreal and I felt so privileged to be there." The relationship between special and mainstream schools during the Festival has a huge impact on all students involved. "My abiding memory of the Festival would be my first cast workshop in Maidstone where my students were at the Cast Workshop with a special needs school. It was a touching experience to see my students actually helping them along, learning from these other students with special needs as well. There was a really close bond built between the students in that morning I guess that’s got nothing to with Shakespeare, but if the Festival was to provide one memorable experience it would be that for me." The Shakespeare Schools Festival has seen the lives of children all over the country transformed by the power of performing Shakespeare. From building confidence to learning to work within a team, the shared experience of putting on a show can have a lasting impact on the individuals that take part. Before participating in the 2012 Festival, one student in particular was struggling to be heard in class. For years, Ben’s stammer had affected his self-confidence. When he was chosen to play the leading role of Macbeth many were concerned about whether Ben would be able to overcome his speech impediment for the performance. By providing a safe and supportive atmosphere in rehearsals, Ben’s fears were soon replaced by confidence and enthusiasm. By the performance, his stammer had completely vanished. Mark Shenton, Ben’s teacher and director, was astounded at the transformation. "There was one moment when Lady Macbeth was off sick, and he did his scene with her as a monologue, jumping from side to side because he’d learnt all the lines." "It’s such an end goal. That bit is the most important, that’s the carrot on the stick. They have to have these incredibly important skills, confidence and teamwork, they learn that they have to have them." "When you start rehearsals you start with a blame culture... by the end of rehearsals that doesn't happen – they’re helping each other and praising each other, they’re really nice to each other, and it is a lasting effect." Ben’s story demonstrates how the Festival process can have a long term impact. Teachers Liz Roberts and Pauline Sallis employ a range of performance techniques to ensure that their special needs students at Dorin Park School are able to fully understand Shakespeare’s texts. Dance, movement, chanting and singing are used to explore the themes and stories of the plays. The challenge for the teachers is to try to give meaning to abstract words and concepts. Looking into the line ‘What’s done cannot be undone’ from Macbeth, they posed the question: have you ever done something you wished you hadn’t done? One of their students pondered the matter for a long time before finally replying profoundly that actions couldn't be rubbed out like a mistake in a book. "She looked at me and said, ‘Full fathom five thy father lies’. She didn’t even say hello - just those words." Demonstrating the power of these plays and the lasting imprint SSF can have on the lives of special school students regardless of disability. "Jacob has been able to shine within the tech team – guiding the others with lighting and sound." 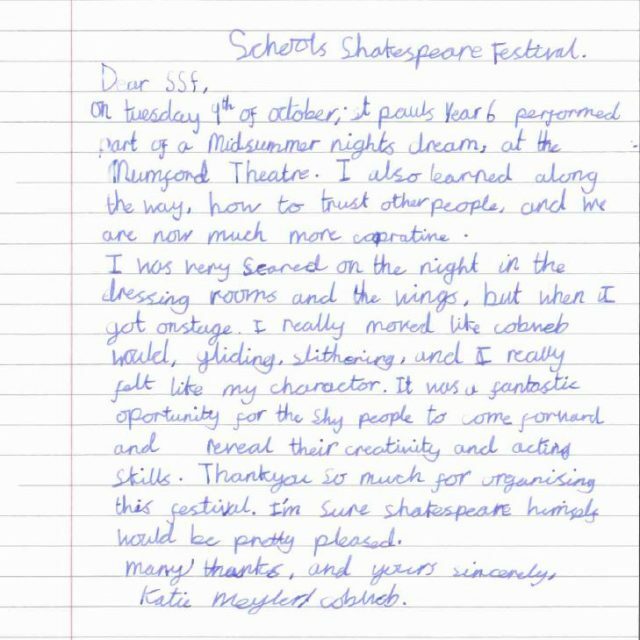 As his teacher points out, Jacob’s experience as Technical Student shows that the Shakespeare Schools Festival ‘isn’t always about the acting’. The technical team at The Sherman Theatre in Cardiff were so impressed by Jacob’s knowledge and professionalism that they sent a letter to congratulate and encourage him. Y Bont Faen, in their second year of the Festival, sees the experience as a means of developing pupils within the context of the wider community. It has become a part of the transition process from year 5 to year 6, and more generally a bonding exercise for the class. "SSF has given us, as the Y Bont Faen family, a brilliant platform to showcase our pupils and their talents." For this school, an important aspect of the festival experience is the potential to involve students who are ‘uncomfortable with the idea of performance’. Jacob was fearful of performing, but extremely able with using and understanding technology. He mapped out the lighting and sound changes from watching rehearsals, and then presented this to the class for their feedback. "It was an honour to watch Jacob interact with the tech team, taking control of the desks and asking really in-depth questions about their roles and responsibilities." The professionals were so impressed that they allowed Jacob to help with the cues in another school’s production. Thomas Feierabend, the Deputy Chief Electrician, then wrote a letter to Jacob, commending his ‘sterling work’ and telling him that he has ‘the potential to succeed in the technical events industry’. "I have loved the experience and it has made me consider a career in technical theatre." Jane is aged 10 and from Ghana, and took part in the Festival while at South Rise primary school in Greenwich. She played Mark Antony in the school's production of Antony & Cleopatra; her story is an example of the way Shakespeare can illuminate and transform a life. When Teacher-Director Jenny Chapman, invited Jane’s mother in to discuss the extra work load, it transpired that Jane’s maternal grandfather in Ghana had named all of his children after Shakespeare characters. Jane's mother was even named Viola - but had never seen or read a Shakespeare play, and did not know which one her name was from. Participating in the Festival allowed the family to join the dots and learn more about themselves and their history. And to her family’s pride, Jane has gone on to perform with SSF at the House Of Lords and the BT Tower. Every pound helps to give a young person crucial life skills, confidence, self-esteem and collaboration which last long after the curtain falls.